Jesse Vissers writes a critical essay on the exhibition ‘How Far How Near’ in the Stedelijk Museum in Amsterdam. Picture: Billie Zangewa, Midnight Aura, 2012. A case-study of the exhibtion ‘How Far How Near’ – The World in the Stedelijk (Museum Amsterdam). In the hallway of The Stedelijk Museum leading up to the current blockbuster exhibition, there is a poster by SAS airlines showing an African woman surrounded by a woven basket, a traditional pot and two drums. (fig. 1) The woman is wearing a typically African dress, she’s got exotic adornments in her ears and hair, and she’s jamming on the drum in front of her. In the sky above her, a small airplane is discernible. The woman is shown from the side, looking away towards the airplane. The poster is an airline advertisement. It presents South Africa as a country where one can go to experience and enjoy the traditions of African culture. Whether a tourist going to South Africa would actually be able to see this traditional African culture remains the question. The poster is from the 1950’s, a time during which South Africa’s black and white population lived almost completely segregated by the apartheids regime that was based on a racist ideology. The contradiction between admiration of another culture for its exoticism, while at the same time dominating and repressing it is one of the prominent features of the colonial discourse of the Other. This poster is part of the exhibition ‘How Far How Near – The World in The Stedelijk’ (2014). 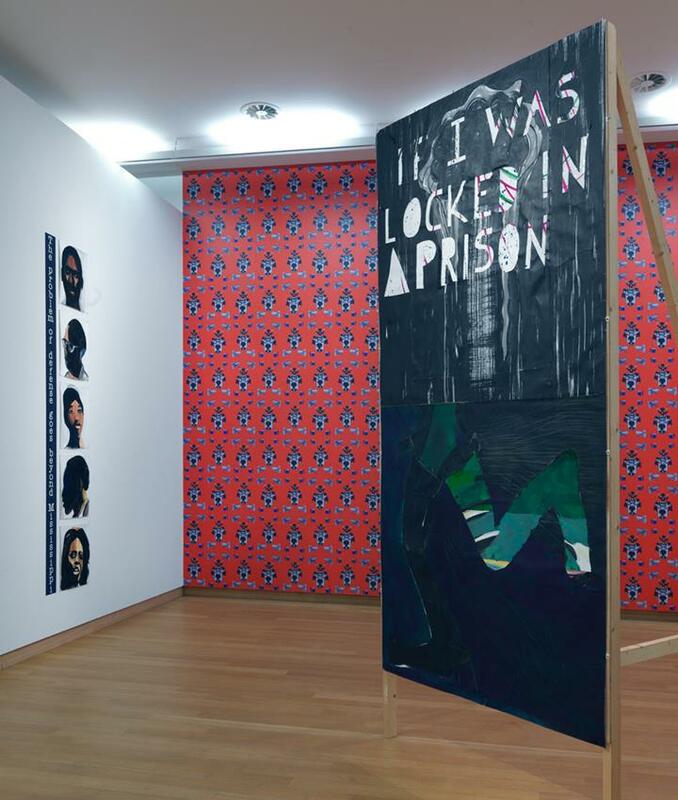 The Stedelijk museum, prompted by some recent acquisitions by African artists and its global collaborations program (1) has turned its gaze towards ‘art from outside the museums former geopolitical boundaries.’ (2) By doing so, the museum is opening up to the post-colonial debate. One of the themes that this debate is concerned with is how the Other is presented in the museum. (3) In this essay I will contribute to this debate by asking the question: “To what extent is the concept of the Other present in the exhibition ‘How Far How Near – The World in the Stedelijk’?” To answer this question I will elaborate further on the concept of the Other, giving some examples of how the Other is present in the current exhibition. I will thereafter discuss the concept of Others shortly and show how this concept is used in this exhibition. In the last part I will reflect on how the presentation of Others in the exhibition relates to the narrative of the museum. First of all clarification on the concept of the Other is needed. The Other is a complex concept, used with different meanings in different scholarly traditions such as anthropology, sociology, philosophy and psychology. The concept is used in processes of identification. In its most basic sense the meaning of the other is based on difference from the self. In this essay I will use a more specific definition that is used in the post-colonial debate where the term is referring to the colonial Other that was created by European hegemonies that in the past differentiated between imperial and other cultures through a categorization of racial, cultural and geographical differences. Homi K. Bhabha (4) describes in his influential paper The Other Question: Stereotype, Discrimination and the Discourse of Colonialism that the objective of the colonial discourse is “…to construe the colonized as a population of degenerate types on the basis of racial origin, in order to justify conquest and to establish systems of administration and instruction.” By construing the colonized as degenerate, the colonial discourse placed a hierarchical ordering onto humanity thus creating dichotomies between self/other meaning in this case imperialist/colonized (5,6). Following this discourse I define the Other as the colonial representation of other cultures in which people from colonized cultures are depicted as degenerate, primitive, exotic or alien. 2. 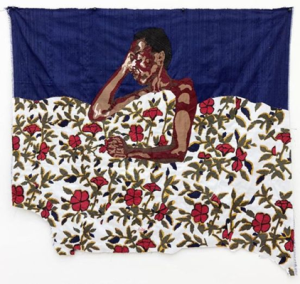 Godfried Donkor, Wallparer (detail), 2014. Where is this Other represented in the Stedelijk exhibition? One of the clearest examples is found in the work Organized creation of dissatisfaction I (short boy wallpaper), 2014 (fig. 2) by the Ghanaian artist Godfried Donkor (Kumasi, 1964). 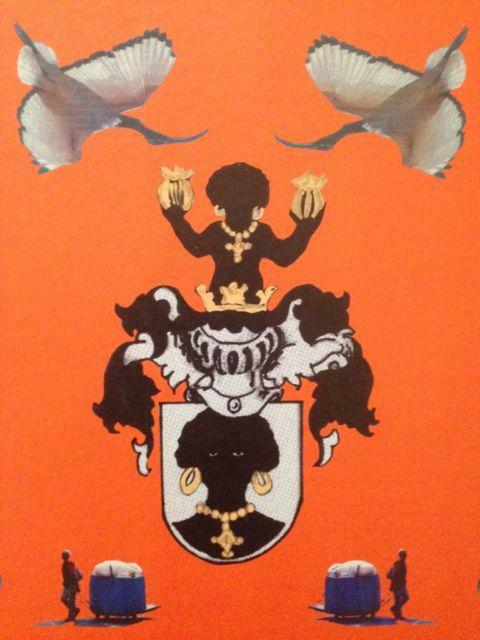 It shows a European family emblem displaying a Moorish character. It contains a stereotyped image of a black female figure with afro hair and golden earrings. This image explicitly refers back to the concept of the Other. The Moorish character is drawn in contours. Only the outlines of the person are made visible. The ‘important parts’ are drawn with clear distinction: the golden earrings and the necklace hanging around the neck as a chain. In the emblem, above the Moorish head another figure is seen holding up two golden objects besides the head thus mimicking a three-armed chandelier. Through this presentation the figure is objectified, thus alienating it. In other words, making it difficult to identify with from an imperialist viewers perspective. Through this objectification and alienation the emblem presents another race as degenerate and inferior. There are many more images in the exhibition in which this Other is present. There are photographs in old European and American magazines that stereotype indigenous tribes as primitive savages. There is the exotic Other that is presented in colonial posters for travel agencies such as the poster I have referred to in the introduction, and there are pictures of Dutch colonial exhibitions showing Javanese artefacts, which can be read as “Testimonies to the power and dominance of imperialist culture, showing ‘trophies of empire’ of ‘the Other’” (7). These examples show that the representation of the colonial Other is visible in the exhibition. These images of the colonial Other are not only still visible, more importantly, they are also criticized by artists, in for example Donkors work. In the upper two corners above the earlier described emblem two Ibis birds are shown upside-down. In the lower corners there is a figure pulling a cart with plastic trash. According to the exhibition text these are two of the icons of Johannesburg. The holy Ibis bird is known to scavenge on rubbish dumps; the person pulling the cart is a short boy. Short boys are poor black laborers who collect recyclable plastic in the city. This collage is repeated as a pattern and printed on orange wallpaper on the museums wall. 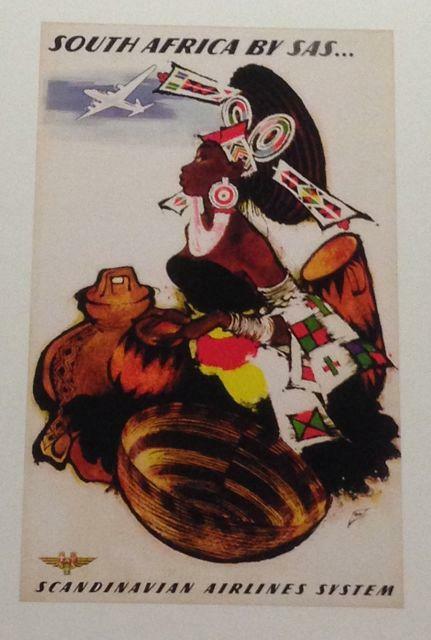 The artist has chosen to print the images of the colonized Other emblem, the short boy, and the ibis birds on an orange background for a reason. He is referring to the relationships between migration, poverty and environmental problems of contemporary South Africa, and its colonial history, the orange background referring to the Dutch colonial history of slave trading. The work is not hung on the wall but is produced as wallpaper. It doesn’t fit in with the western tradition of hanging pictures on the exhibition wall, it also reflects on how problematic heritage issues often go unnoticed lingering in the background. 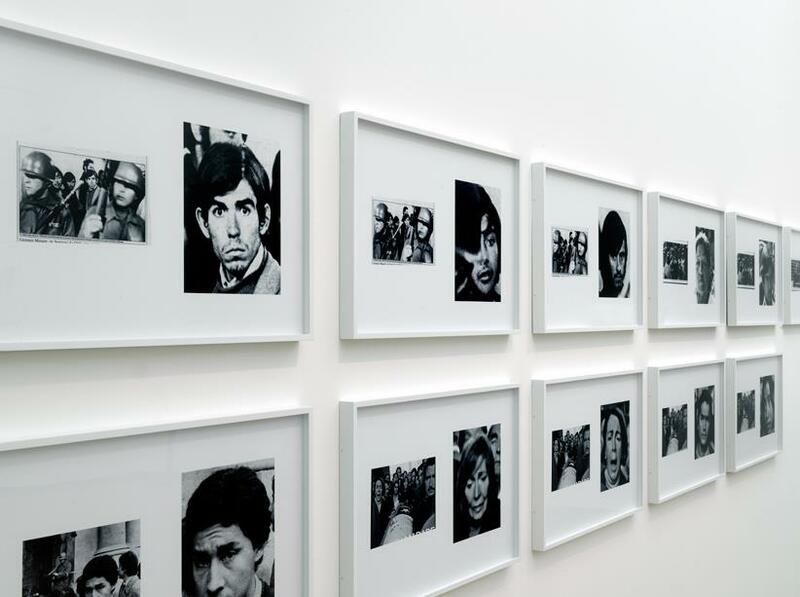 The work is politically charged, it makes the viewer aware of his or her own heritage. 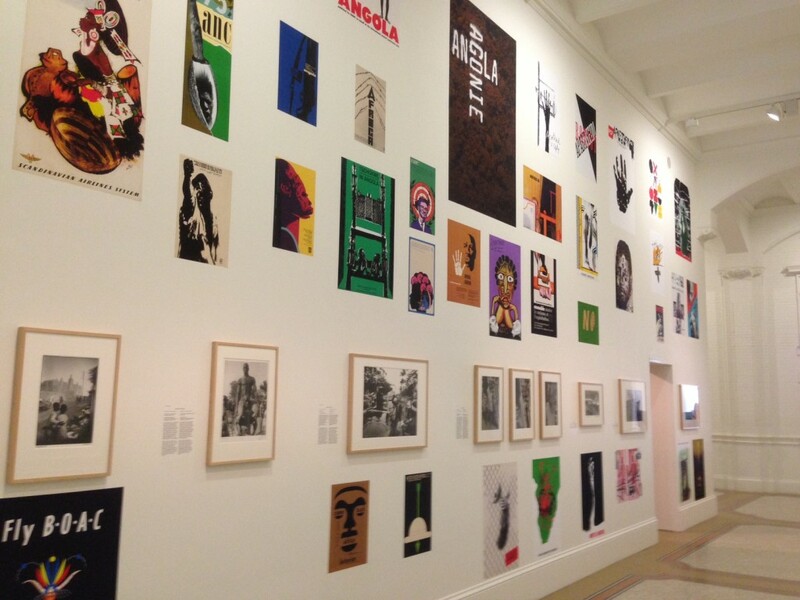 The museum chose to exhibit the colonial wallpaper together with images such as Grapus’ Anti-Apartheids posters which are heavily politically charged works. This too is done for a reason. In the exhibition the image of the colonial Other is criticized and placed in a historical context. To understand why this is done we need to look at what happened after decolonization. critiques linguistic oppositions, they call binary oppositions, as self/other and imperialist/colonized for they arbitrarily favor one term over the other and don’t take into account nuances in relationships between oppositions. (8) Post-colonial critique questions the idea of a self/other dichotomy. Its scholars have criticized Western museums for the way they represented Other cultures. (9) The self/other dichotomy is, as Nederveen Pieterse (10) explains in his article multiculturalism and museums – Discourse about Others in the Age of Globalization “destabilized by accelerated globalization.” It is through transnational traffic of goods, cultures and people that changing notions of identity are taking place. As Spivak said, the Other seems “a hopelessly static notion” thus scholars nowadays speak of Others “… In the plural because of the Big Three – race, class, gender – and because of national origin, religion, lifestyle, sexual preference and age.” (11) It is through these terms that individuals nowadays differentiate themselves. The discourse changed from the Other to Others. It is these Others that are the object of focus in the Stedelijk museum’s exhibition. In specific Others of race and Others of national origin. 3. Lidwien van de Ven, Berlin, 15/10/2013 (refugees), 2014 (photographic wallpaper). These Others are shown in the presentation of Lidwien van de Ven’s (Hulst, 1963) work Berlin 15/10/2013 (refugees), 2014 (fig. 3). In it, a group of people in raincoats under umbrellas are photographed on a rainy Pariser Platz in front of the Brandenburger Tor. On the umbrella’s texts such as ‘kein mensch ist illegal’ are read. When reading the label next to the work it explains that the group of people consists of refugees who are on hunger strike to gain political attention. The group is symbolically situated between the US embassy and the German delegation for the EU council that are both located on the Pariser Platz. Refugees are Others without any power and position in Western society. They are Others of national origin and Others of race. Refugees as a group are defined by the existence of nation states. They bare traces of the Other because seen from a juridical perspective they are alien. They are not let in, they have no rights, and they are illegal. Now why did the artist choose particularly refugees? This work was made as a commission for this exhibition. Perhaps she’s symbolically referring to the Other cultures that are not led in to speak in the museum. Refugees show that this is still a bordered world in which there is a difference between Us and Them, the first world and the third world, rich and poor. Dichotomies of self/other are still in place in the world of politics today and perhaps in the museum too. How the museum has told the story of who ‘we were’ in the past is clearly visible in a former exhibition called Moderne kunst – Oud en Nieuw held in the Stedelijk in 1955, that How Far How Near takes as its point of departure. In that exhibition artworks by modern Western artists such as Lipchitz, Klee and Picasso were shown next to primitive art from across the globe. The goal was to show that free expression and abstraction are universal qualities and are present in all cultures and through all times. The works of the primitive Others were used to support the narrative of modern Western art, not deserving an exhibition as artworks on their own. ‘How Far How Near’ reflects on this former exhibition by presenting its catalogue and photographs in a showcase. Through exhibiting this past exhibition, the museum is reflecting on its former identity. Apparently it was an institute only concerned with the story of modern Western art. The museum is exhibiting its former way of dealing with art from other cultures; in the present exhibition the museum shows that it has changed its perspective, and its identity. It is now for the first time in its history showing contemporary art from Other cultures. So how is the museum presenting the narrative of Others? As new museologists have suggested, the museum should let the Others in, handing them the authority to tell their own story. (14) The Stedelijk museum seems to follow this line of reasoning. E.g. Godfried Donkors earlier discussed work is one of the commissioned works for the exhibition. The artist exposes us to his side of the story which can be informative to museum visitors. His work invites people to think about how they relate to their colonial past. The museum has chosen to present the Other narrative through the exhibition strategy that Nederveen Pieterse describes as reflexive representation. These exhibitions are “reflexive in the sense of self-questioning, problematizing the politics of representation itself…exhibitions not about others, but about the relationship between selves and others” (15). The Stedelijk exhibition has as its central question: “Why was the museum’s exhibition and collection policy so geographically restricted until now?” Through this question the museum is indirectly referring to its relationship with the Other. For the exhibition the museum’s curator researched the collection depot, searching for works from geographic locations outside of Europe, finding that artists from Africa, South-America, and South-East Asia were very scarcely present in it (16). What did come up were many (documentary) photographs, and posters concerning these continents, but barely any non-photographic works. The exhibition is actually the presentation of what the museum has found on Others in its own collection through a self-reflexive research. The exhibition contains three rooms that are filled with the works concerning Others from the museums own collection, with the exception of the two newly commissioned works. The largest room is filled mainly with the recent acquisitions of African artists, of the smaller ones, the first is filled with three works concerned with the Chilean Coup-d’etat of 1973 by Alfredo Jaar (Santiago de Chile, 1953) (see fig.4), the second contains documentary photography works by artists concerning a range of themes, e.g. suicide bombers in the Israel-Palestine conflict, repressed black people during South-Africa’s apartheid regime, and the war in Lebanon. Besides these three rooms the exhibition is extended into the earlier described hallway, where posters and photographs of the colonial period, the decolonization, and the anti-apartheid movement are hung (see fig. 5). The museum leaves the answer to the question why its collection and exhibition policy were so geographically restricted, to the viewer. Who through the exhibition has to connect the dots himself by investigating the posters and photograph collection in the hallway, and the three room collection of modern art from other places? If the visitor is pertinacious enough he can find out that the reason the museum hasn’t collected any art from Others in its past, has probably to do with the fact that during times of colonial discourse the Other, and thus also the Others’ art were seen as inferior. Even more disturbingly these colonial ideas perhaps lingered on until not so long ago, because as the exhibition states, it is through this project that the museum is opening up to art from others for the first time. Of course the museum doesn’t want to present itself as an institute that until recently favored the dominant Western art over others. And therefor this narrative is hidden, only inexplicitly present to the visiting audience. It is perhaps even questionable whether any visitor not explicitly searching for it will notice it. Through exhibiting works of contemporary Others the museum is showing that it has changed its perspective. The museum wants to tell the viewer that it is on the right track because nowadays it is treating all cultures as equal and concerning itself with art from across its former boundaries. But what does looking at art from artists outside of the geographical boundaries mean? It seems to imply that the museum is showing works from ‘original’ African, Latin American and Middle Eastern artists, artists from the Other places. This is not really the case though, because there are works by Dutch artists such as Lidwien van de Ven, and Michael Tedja (Rotterdam, 1971) in the exhibition. Besides that, many artists have been residents in Western cities for a longer period of time. For example Alfredo Jaar and Godfried Donkor live and work respectively in New York and London. Many artists on show in the exhibition have a Western cultural background and are raised in the Western tradition of art. E.g. Meschac Gaba (Cotonou, 1961) and Iris Kensmil (Amsterdam, 1970) both studied art in Amsterdam. If the museum sees Others as artists from different cultural backgrounds it is not necessarily showing those. The question whether the museum has really crossed any boundaries is questionable. Installation View with Donkors wallpaper and works by Iris Kensmil (left) and Michael Tedja (right). Museums have their own narratives and ”subtext comprising innumerable diverse, often contradictory strands, woven from the ambitions, the intellectual or political or social or educational aspirations and preconceptions of the museum director, the curator, the scholar and the designer…” (17) So what is the subtext in this exhibition? According to Susan Lêgene in Bezeten van vroeger: Erfgoed, identiteit en musealisering objects embody values and have different meaning for different communities. “What is present in museums can be shown, and be put to tell a story. But what is not there or not recognized, because it is submerged in a certain art historical or ethnographic classification, what is repressed or forgotten has, if one isn’t careful, not existed” (18). The formerly hidden narrative of the Other that is now on show in the museum is not so ‘Other’ at al. The fact that the museum hasn’t collected any art from ‘Outside its former geographical boundaries’ can be answered by the fact that colonial and Other cultures were seen as inferior. 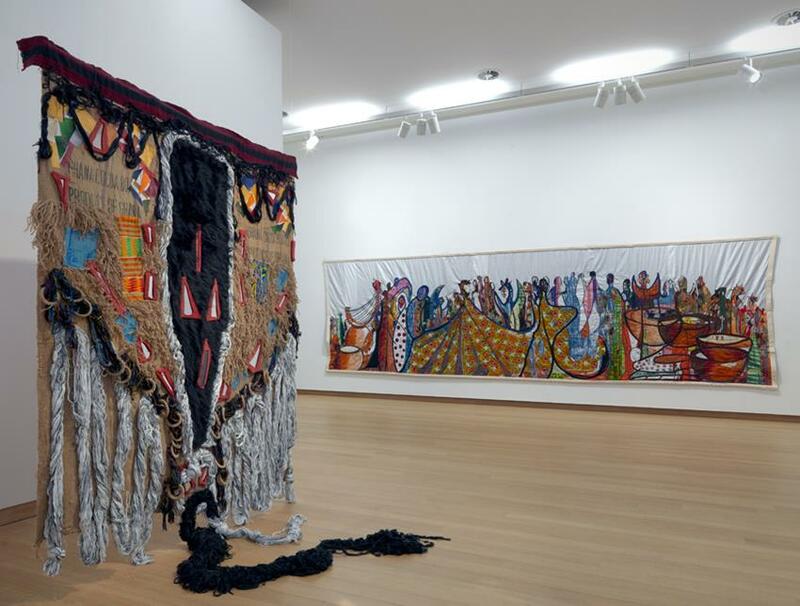 Installation view with works by Dorothy Akpene Amenuke (left) and Abdoulaye Konaté. What is missing in the exhibition? A striking notion is that the exhibitions introduction text doesn’t talk about colonialism. After reading this essay, it might have become clear that the exhibition is dealing with colonial material. The fact that Other cultures have been left out of the Stedelijk museum up to the 21st is actually very striking. The museum doesn’t harshly confront itself or the visitor with this disclosure. Instead it moves around the painful stuff, and just plainly states that it is now for the first time looking for art from other places, from the rest of the world. And that is perhaps a missed chance to make a strong statement about museums, colonialism and our heritage. 1. Global Collaborations is a three year project (2013-2015) through which the museum is trying to get a well-informed and nuanced view on developments in art from a global perspective. Bhabha, Homi K. (1996). “The Other Question: Stereotype, Discrimination and the Discourse of Colonialism”. In Black British Cultural Studies: a reader. H.A. Baker Jr, M. Diawara and R.H. Lindeborg (eds.) Chicago: Chicago University Press, pp. 87-106. Harrison, Julia D. (1994). “Ideas of Museums in the 1990s”. Museum Management and Curatorship 13, pp. 160-176. Harrison, Julia D. (1997). “Museums as agencies of neocolonialism in a postmodern world”. Studies in Cultures, Organizations and Societies 3:1, pp. 41-65. Hight, Eleanor M. and Sampson, Gary D. (2002). “Introduction: Photography, “race”, and post-colonial theory”. In Colonialist Photography: Imag(in)ing race and place. Eleanor M. Hight and Gary D. Sampson (eds.). New York: Routledge, pp. 1-19. Karp, Irvan. (1991). “Culture and Representation”. In Exhibiting Cultures: The Poetics and Politics of Museum Display. Irvan Karp and Steven Levine (eds.). Washington DC: Smithsonian Institution Press, pp. 11-24. Legêne, Susan. (2005). “Canon van verschil. Musea en koloniale cultuur in Nederland”. In Bezeten van vroeger: erfgoed, identiteit en museale cultuur. Rob van der Laarse (ed.) , Amsterdam: Spinhuis, pp. 124-152. Nederveen Pieterse, Jan. (1997). “Multiculturalism and Museums: Discourse about Others in the Age of Globalization”. Theory Culture Society 141, pp. 123-146. Bouwhuis, Jelle. (2014). “How Far How Near – The World in the Stedelijk”. In Stedelijk Museum exhibition catalogue How Far How Near – The World in the Stedelijk. Jelle Bouwhuis (ed. ), Amsterdam: Stedelijk Museum Amsterdam, pp. 1-63. Vergo, Peter . (1989). “Introduction”. In The New Museology. Peter Vergo (ed.). London: Reaktion Books, pp. 1-5. Jesse Vissers, student Museology, Amsterdam.